I wanted to share with you this amazing handcrafted watercolor brand called Eventually Everything Mixes! Recently I got to meet Amé on a trip to Berlin. She is a wonderfully sweet and kind person, and she obviously put a lot of thought into the processes she uses to make her watercolor paints. Her paints are all vegan and cruelty free. That might sound my distance distinction, but the majority of watercolor paints have either honey or ox gall (which comes from the gallbladder of cows) in them, which makes them not vegan. Instead, Amé uses sugar syrup and synthetic ox gall as the humectant and wetting agent in her paints. Personally, I am not vegan, but I do believe in trying to make the products that we use as free from cruelty and as gentle on the environment as possible. This is obviously something that Amé cares about. Not only are her products free of animal byproducts, but she also even notes when the pigment might be dangerous to the water supply and aquatic life. This is something that’s almost never noted and is really important since watercolors are often flushed down the drain. In addition to all of this, her paints are beautiful, moody, and inspire me to be more creative. Amé gave me a full pan of Pyrelene maroon, a bottle top of Lausitzer Ochre, and a dot sheet with Water By The Pier and Free He Wanted To Be. The dot sheets were very generous, and I’ve done several paintings and all of my swatches with these alone! p>You can see in the slots is that all of these colors are pretty granulating. Even though purely maroon, which is not actually a granulating color, has a more textural quality than in other brands. The colors are all extremely highly pigmented, and they have a medium level of dispersion. Even though I am a stickler for single pigment colors, I am absolutely in love with “Water by the Pier” and “Free – He Wanted to Be.” Normally I don’t see any reason to have a great color on my palette, but that granulation and the different colors in ”Free – He Wanted to Be" entrance me every time I use it. This is the part that I was worried about. I have never used handmade watercolors before, but I know that watercolors which are not correctly formulated or not correctly mulled can be very difficult to mix and glaze. But this is not the case with these pains. They paint and makes just like I would expect them to and it’s easy to get a wide range of colors from just the four paints that I have. Obviously, this is not a high intensity palette, but I was still able to get some version of basically each color. These colors rewet pretty easily, although there is a bit more difficult re-wetting the Lausitzer Ochre. It’s pretty common for first colors across brands to be more difficult to rewet. “Free – He Wanted to be" was also a bit more difficult to rewet, and clearly had a bit more binders and the other paints. It had a sort of a gummy texture. It’s also more muted in intensity. The easiest color to work with was the Pyrelene maroon, which is crazily intense as soon as you put a brush into it. No problems here either. I painted a portrait, which normally includes a lot of layering and glazing. The collars had no trouble staying on the paper and did not lift off inadvertently. One thing that I did notice is that the colors seem to stay wet on the page longer than with my conventionally made paints. These pains are very vibrant and have very deep color. However did notice that, depending on the paper you use, they may be a fairly large color shift. The colors are much darker when they are wet than when they are dry. However the saturation level seems to stay about the same, and the colors do not become pale and washed out after drying. If you want to dip your toe into the world of handmade watercolors, I would definitely start with this brand. I don’t often add new colors to my palette now that I’ve decided on a set of colors, but I find myself often wanting to play with these paints. I’m not sure if it’s the moody colors, the scent of cloves, or the memory of meeting Amé, but using these payments is very freeing. If you like deep, dark, moody paints with a lot of texture and the smell of clothes, then these are the perfect paint for you. 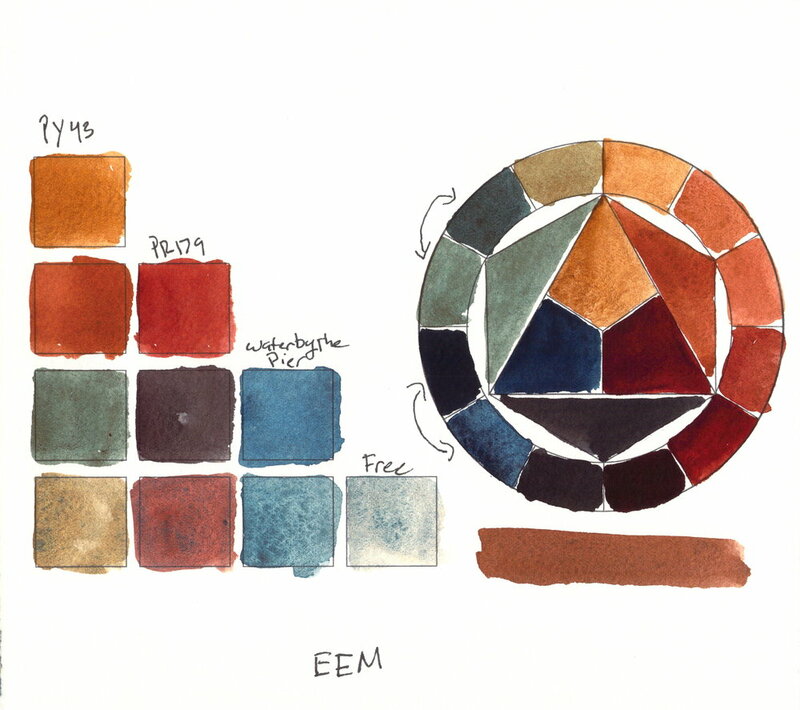 If you are looking for a high-quality, vegan watercolor brand, this is absolutely perfect. Of course we can’t forget that every purchase helps the support an independent artist who also organizes workshops to help get people acquainted with making art! This is a great first experience with handmade watercolors, I really want to try out some more colors in her line, and see how they compare with other handmade watercolors!